There is absolutely nothing that God can’t do through faith. 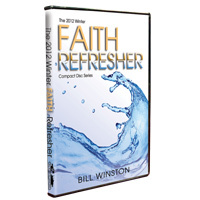 In this special compilation taken from the 2012 Winter Faith Refresher, Dr. Bill Winston shows you straight from the Word of God how to take a mustard seed size of faith and move mountains. Let the revelation shared in this exciting teaching series help you to propel your faith to a whole new level of power as you use the Word of God to refresh your faith!